Frank W. Abagnale, one of the world’s most respected authorities on the subjects of forgery, embezzlement, and secure documents, has signed with Broadway Books, an imprint of the Doubleday Broadway Publishing Group division of Random House, Inc., to write the definitive book on how consumers can protect themselves against the growing crime of identity theft. Charlie Conrad, Executive Editor for Broadway Books, acquired world, first serial, and audio rights from Andrew Blauner of Blauner Books Literary Agency, who represented Mr. Abagnale in negotiations. One of the most daring con men, forgers, imposters, and escape artists in history, Mr. Abagnale enjoyed a brief but notorious criminal career during which he assumed various identities -- including those of airline pilot, stockbroker, and doctor -- in order to pass off approximately $2.5 million in phony checks before he reached the age of twenty-one. Mr. Abagnale’s youthful exploits were chronicled by director Steven Spielberg in the December 2002 DreamWorks motion picture “Catch Me If You Can,” starring Tom Hanks, Christopher Walken, and Leonardo DiCaprio, who played the role of Mr. Abagnale. The movie was based on Mr. Abagnale’s bestselling autobiography of the same name, originally published in 1980 and reissued by Broadway Books in 2000 as a trade paperback. The Broadway trade paperback editions of that book have more than 530,000 copies in print after 19 printings. In 2001, Broadway Books published Mr. Abagnale’s second book, The Art of the Steal, which currently has more than 90,000 copies in print. 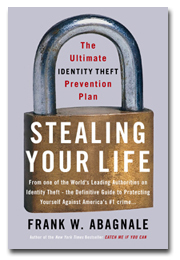 To be titled Stealing Your Life, Mr. Abagnale’s new book will offer an in-depth portrayal of the threat that identity theft represents to individuals (in 2004, it claimed more than 10 million victims, with losses exceeding $54 billion) as well as a complete guide to how individuals can protect themselves from this insidious crime. Drawing on true stories from his experience as a consultant to the FBI and to banks and corporations that have been affected by, and are working to combat, identity theft, Mr. Abagnale will vividly chronicle how identity theft has been fostered by the proliferation of sophisticated digital technology and why it has become a crime so versatile that literally everyone is a potential victim. Among the practical issues Abagnale will cover are strategies that work against identity theft, where to get checks and credit cards, what consumers should ask of their bank, how to monitor credit, how to safeguard one’s Social Security number, and many other techniques indispensable to protecting identity. The book will also include easy-to-use identity theft checklists, updated for the latest cons that consumers can use to gauge their personal immunity level, as well as what software consumers need to do to protect their identities online. Infused with real-life examples of identity thefts that have not been previously reported, Stealing Your Life will also analyze some of the major identity theft crimes that have made headlines, explaining how they really happened, who was at fault, and how the crimes could have been averted. The book will be published in 2007. Frank Abagnale has lectured to and consulted with hundreds of financial institutions, corporations, and government agencies around the world. He has been associated with the Federal Bureau of Investigation for more than 30 years and lectures extensively at the FBI Academy and for field offices of the FBI. More than 14,000 financial institutions, corporations, and law enforcement agencies use his fraud prevention programs. For more information, please contact David Drake at Broadway Books at 212-782-9001 or ddrake@randomhouse.com.